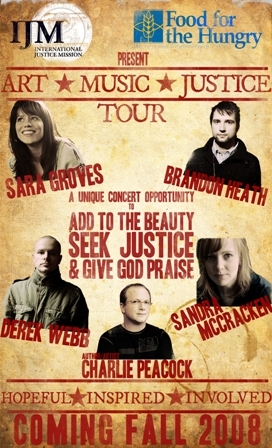 Sara Groves, Brandon Heath, Derek Webb, Sandra McCracken, and Charlie Peacock are putting on the Art * Music * Justice Tour this fall, Sept 17- Oct 26. Sounds like a great lineup and a great cause. They are supporting two organizations that are doing important work everyone of us should be aware of – International Justice Mission and Food for the Hungry. You can find out more information about the tour here [the MySpace page]. You can also read more about it at these websites: Sara Groves or Derek Webb or Facebook.